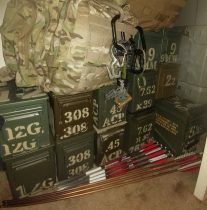 This week on the gunmetal Armory, we are going to discuss how and where to hide your gear covertly, we are going to discuss the various types of gear that you probably should be hiding and stockpiling, we’re going to update you on the things that have been going on within the gunmetal Armory for the past couple of weeks and why we’ve been absent, and we’re going to talk about the adventures that we’ve been on lately and the Gunmetal Armory. One of the things that we have been having happened lately is all of the turmoil that has been happening in our life lately. Our son was recently injured and we have been dealing with the fallout from that for the past couple of weeks with doctors and such. All of that upheaval has really made things difficult for us here in the GunMetal Armory. I cant really go too deep into the details of what happened at the moment but I can say that my son was hurt bad enough that it required immediate emergency surgery. So that was a rough time in our family and the recent happenings. On the other side, we have some really good news in the Armory. I recently went through and got some NRA certifications to add to my list of qualifications. I will tell you all alot more during the actual podcast itself. But ultimately I have alot of ideas on how to shoot better, and even how to carry ourselves with a better, more honorable mindset. I had all these ideas and plans but no base the launch my stuff from, well, now I do. And Thursday night we are also going to discuss hiding your gear and even hiding your preps. Hiding your preps can encompass numerous things like keeping bad people from gwtting them, and even keeping your family from knowing exactly what all you have until they need to. Its all about “Op sec” or “Operational Security”. Keeping your preps secret and secure isn’t easy but it is possible so we’ll talk about that. Another thing we did was traveling. The Mistress of Metal, my son “Kid Steel”, and myself all flew out to the great big state of Texas. We were originally going out there to visit with our in-laws and look around at the scenery that was surrounding each of us daily. We got to travel, not only to the Lone Star State (Texas of course), but we also found our way into Oklahoma for a day. We had some work to do and some business that needed doing. 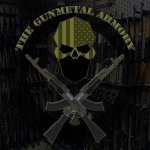 All in all it was a stellar trip but I’ll tell more on Air this Coming Thursday on the Prepper Broadcasting Network, at 7pm Pacific, as always, on your favorite show about firearms and gunsmithing, The Gunmetal Armory!! Listen / Download archived shows for “The Gunmetal Armory” HERE! Next: Next post: The Digital Age: Technology!